At JVIB your claims are our number one priority. 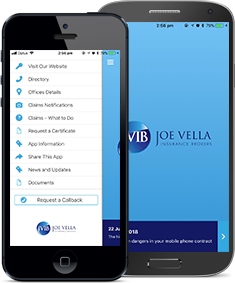 One of the benefits of using JVIB is having one point of contact for all of your insurance needs including making CLAIMS. In the event of any loss or damage, our experienced broking teams will assist you with lodgement, negotiation and settlement of claims on your behalf ensuring the matter is resolved as quickly and efficiently as we are able. Making a claim can be stressful, particularly if it follows an emotional event such as a break and enter or an accident. Your JVIB representative will assist you with the claims process, providing you with the appropriate forms and guidance to understanding the complicated nature of the paperwork. JVIB takes pride in all that they do but most of all, in looking after you. Clients buy insurance for protection and the resulting peace of mind. If you’re unfortunate enough to sustain a loss, this is when you expect your insurance cover to go to work. At JVIB we’re not just a postage box for claim forms. We make it our business to ensure that your claim is dealt with promptly and fairly. We are always available to let you know how your claim will proceed and what is to be expected of you as well as what you’re entitled to expect from your insurer, depending on the type of claim you need to make. Insurance companies want to settle most claims quickly and fairly. But sometimes there are complications that arise or the insurers may incorrectly decline a claim or make a poor decision. This is where we, at JVIB, come in to our own. Critically analyse the claim situation and test the insurer’s decision/s in comparison against the policy wording. Immediately tell you if the insurer is right or wrong and why it is so. Challenge on your behalf, any error in the insurer’s judgement or a failure to perform, so that the claim situation is rectified. As a member of Steadfast Group we have access to additional technical expertise that may be required to finalise, dispute or seek clarification on a claim. Where we believe the insurer has made an error, we can manage and advocate on your behalf any disputed claim that fits within the Financial Ombudsmen’s Service. Should it eventuate that you your claim requires legal action, we will at no cost to you obtain initial legal advice from Australia’s leading insurance specialist law firms (DLA Phillips Fox) on your behalf. JVIB have actually won new clients because their former broker has given up on a claim without any explanation or challenge on the decision. We take pride in all that we do but most of all, in looking after you.